Next year we will have known each other for 50 years. We joined school as little girls with pigtails, today even our daughters are out of pigtails, yet we are still able to revert to that childhood and share the same laughter – it is the spa of friendship – which we revisit every year. We shared the growing years, then grew apart to work, to nurture families and all the stuff that life involves. Some 6 years ago we all connected again to celebrate the 50th anniversary of the old school. Some of us had been in touch in bits and starts, some had been very far away, but that meeting probably came right at the time that it was meant to, we needed the reconnection and we needed that crazy bond that keeps us soaring. 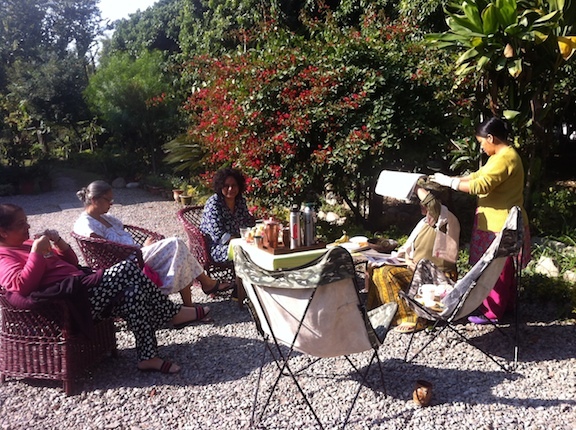 We have spent the last few days together doing nothing in our very own spa full of healthy, home grown food, healthy oils and unguents – red henna and black henna experiments, mad stories and madder laughter. The old trees and gardens of a wholly quirky home allow for wallowing in the sunshine, the whole package allows for a rejuvenation of the soul with the sharing of every bitty, silly story and the whole hearted support of friends that will never judge. Just how lucky were we that the parents left us at those grey gates to form these relationships that so importantly carry us happily through life. This entry was posted in Moments, Stories: fact or fiction and tagged experiences, friends, love, relationships. Bookmark the permalink.